Are you tired of planning your own, family or company event? Hmm… there are some many nitty gritty things to look into when it comes to planning an event. It takes a minimum of one week to find a suitable venue and obtain costing from venue owners, if not more. However, with GreatVenueDeals.com, the venue sourcing process can be done within 10 to 15 minutes on your fingertips anywhere and anytime. This is a Malaysian-born and first ever Online Venue Booking (OVB) platform that offers a myriad of venues and spaces with real time availability and immediate response from venue owners. To complete the GreatVenueDeals.com offering, the event Conceptualiser is available for users to evaluate their event needs options and plan their event budget. The platform’s PR consultants will be able to help when the event calls for the presence of the media. They are trained to handle press conferences and any media relations required. GreatVenueDeals.com has received overwhelming support and positive feedback from all venues approached thus far and this is evident in the 200 over venues that have jumped on the bandwagon even before going live. 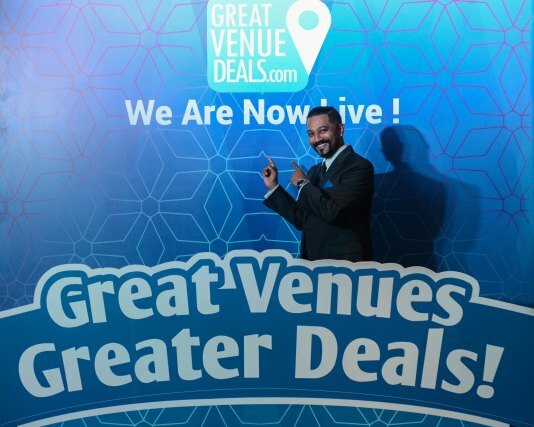 By using GreatVenueDeals.com, you will reduce your search time by 70% which would lead to them leaning towards Malaysia as location of choice for their events. Venues can now also reduce sales & marketing costs and transfer the savings to their actual customers directly. In addition to this, it helps improve low occupancy periods by simply promoting amazing value added deals. GreatVenueDeals.com also offers a monthly report to all venue owners highlighting venue performance based on target audience and specific demographics. The newly launched platform is set to become a leader in OVB not only in Malaysia but soon across Asia with the partnership of many leading organisations and venue owners such as TGV Cinemas, Kidzania, Dorset Hotel, Zenith Hotel and others, together with the expectation of an additional 300 plus venues by August 2017.